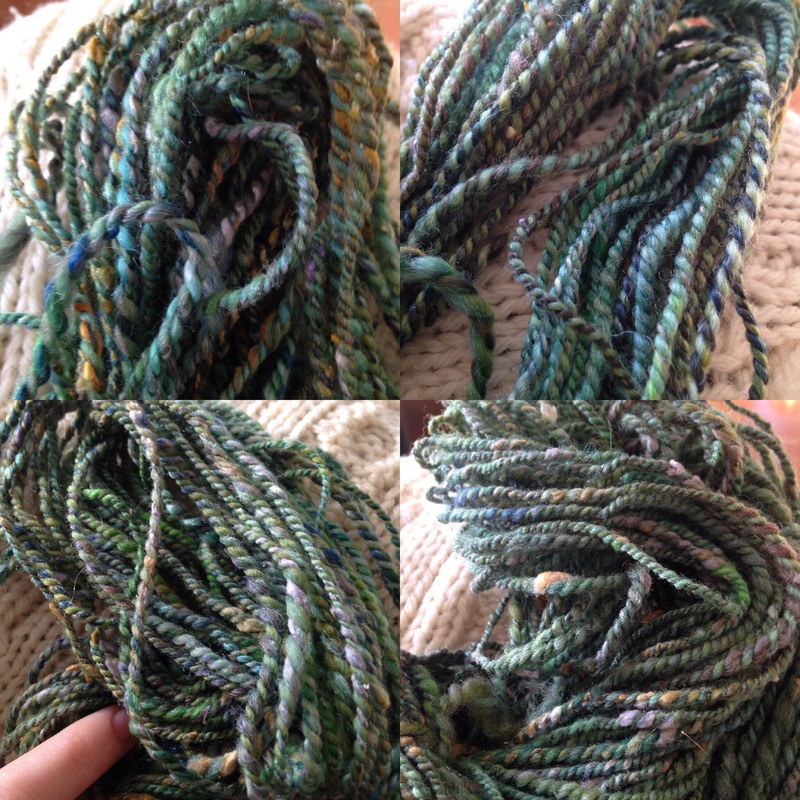 Last week you read about how I fell in love with a yarn sample I made, combining a Polwarth top from Pigeonroof Studios with a crazy art batt from Tempting Ewe Yarns, but how it was super-annoying to combo draft them. I went on the hunt for a way to get those same wonderful results, but without the pain in the neck of having to combo draft. 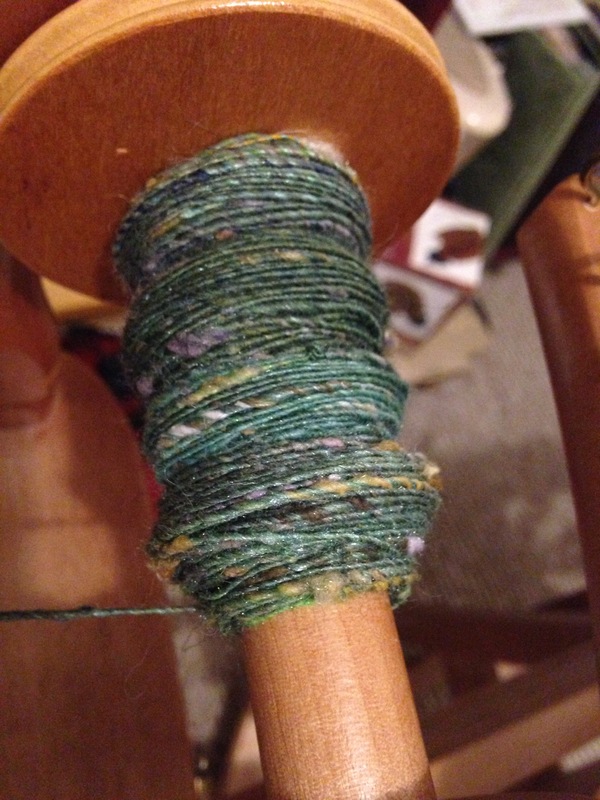 I combo plied, but felt kinda meh about it. My next thought was, maybe I should try prepping the fibers with handcards. 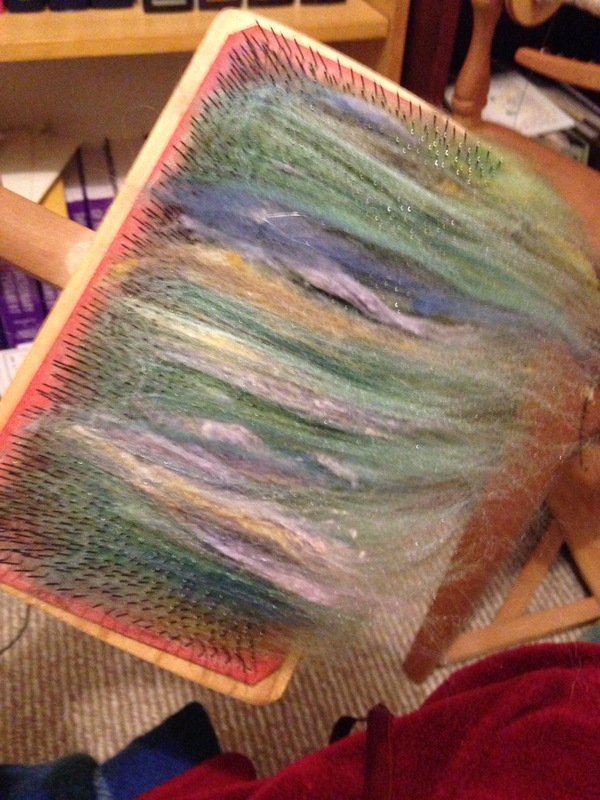 Not necessarily fully carding them, just using the cards to make the fibers play a little nicer together, by stretching out some of those blobs of silk noil, and making sure I had an equal amount of Polwarth in the mix. I floated this suggestion on the Wool N Spinning ravelry group, and Rachel pointed out that this plan could work well, as long as I was okay with the colors blending a lot. I cheerfully contradicted her, saying I suspected the pops from the silk noil would stick around. She, very politely, said nothing, and let experience by my teacher. This blog post by Karen Kahle talks about just using hand cards to blend, not card, almost like a mini blending board. I also read the portion on handcarding in The Spinners Book of Fleece by Beth Smith, which arrived in the mail the day before the handcards. (a) rolags, or just an attentuated mini-batt? (b) two blending passes on the cards, one pass, or just put the fibres on the cards then take them off (no blending)? So I tried them all. Above: attenuated mini-batts, taken right off the cards then stretched out diagonally. From right to left: No blending, one blending pass, two passes. Below: Rolags. From right to left: no blending, one blending pass, two passes. In the prep stage, I found the actual carding really fun. Putting the fiber on was quick, and I could easily keep track of how much I had left to make sure I was putting on similar amounts of each fiber. 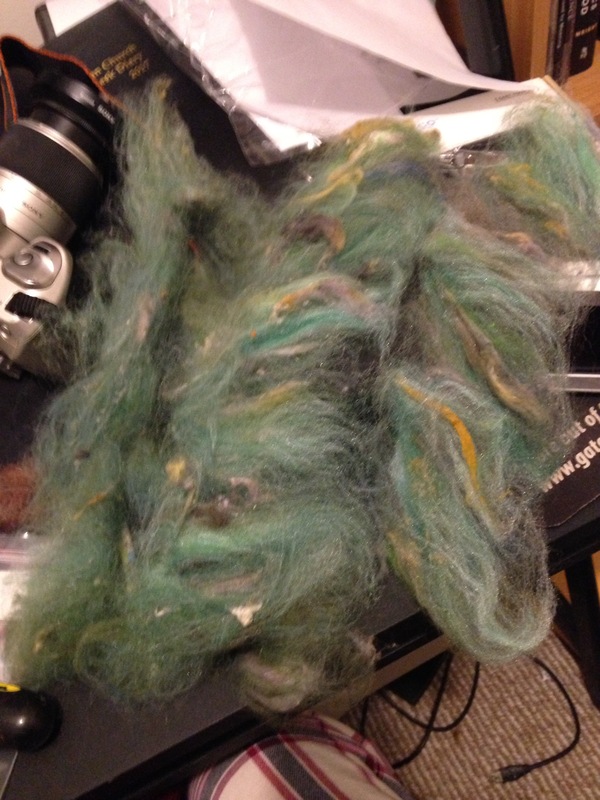 Rolags were easier to make than the attenuated mini-batts, and made more sense of what I was doing. To spin, I arranged them mirror-wise based on how much I was blending: no blending first and last, most blended in the middle – so that, when I plied from a center-pull ball, the most-blended and least-blended portions would match up. I’d have to knit the yarn up to see if there was a difference, of course. I tried to spin the singles evenly, but did not try to control the silk noil very much. I let them pop out and do their thing. The blending on handcards definitely made dealing with them a little easier – a big plus. 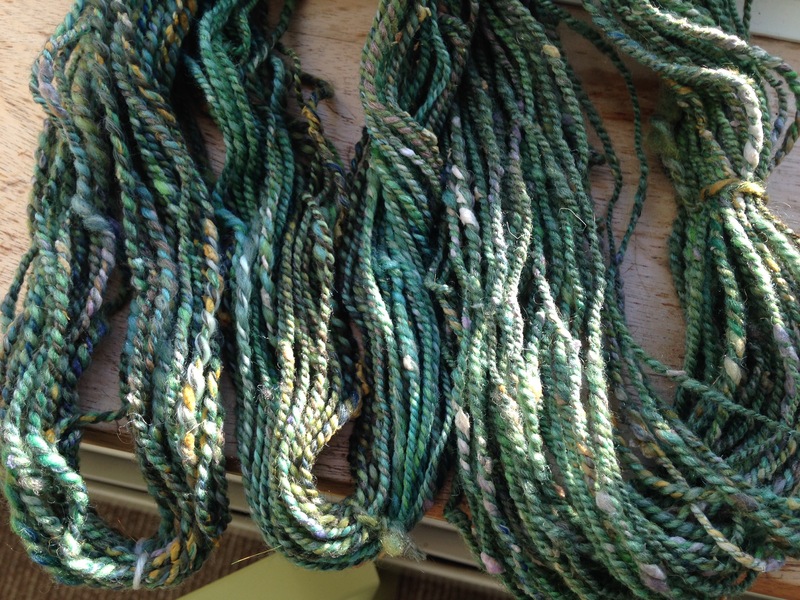 So much so, that I bracelet plied with waaaaay too much singles. Yes, my middle finger is turning blue. Here is the new little dragon-egg that resulted. In the picture above, the third sample is in the middle. In the two pictures below, it’s on the right. I stared and stared and stared at this trio of samples. 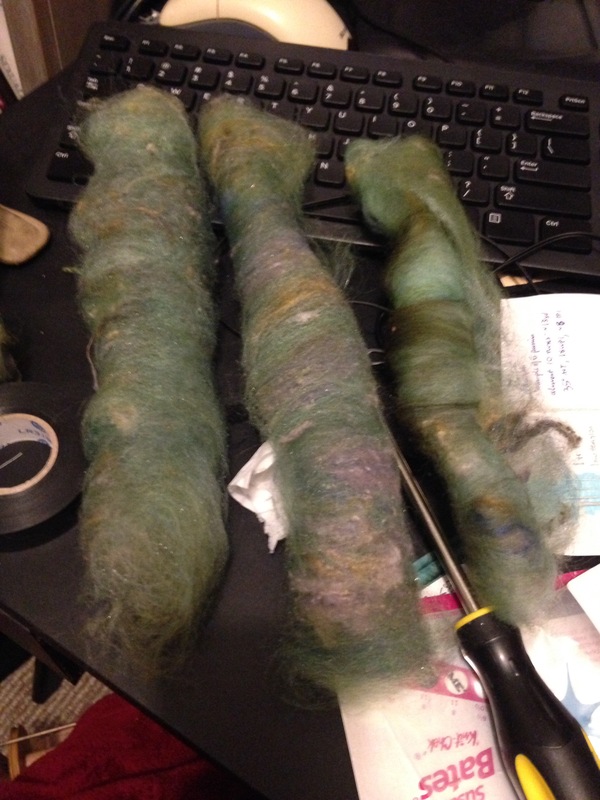 I enjoyed carding and spinning the third sample a LOT, but I couldn’t help feeling something was lost in the blending. The noil stood out, but all the other pops of color were gone. I especially missed the pops of blue. This is what Rachel was trying to give me a heads up about. Frustrated, I went back to the wheel with one more sample idea. Something about the combo ply was bothering me, but maybe I could give it just a little more nuance by doing a combo draft with two strips of the polwarth in one ply and just the art batt in the other. This time I just spun all the combo-drafted polwarth and immediately followed it with the art batt, as you can see on the bobbin below. 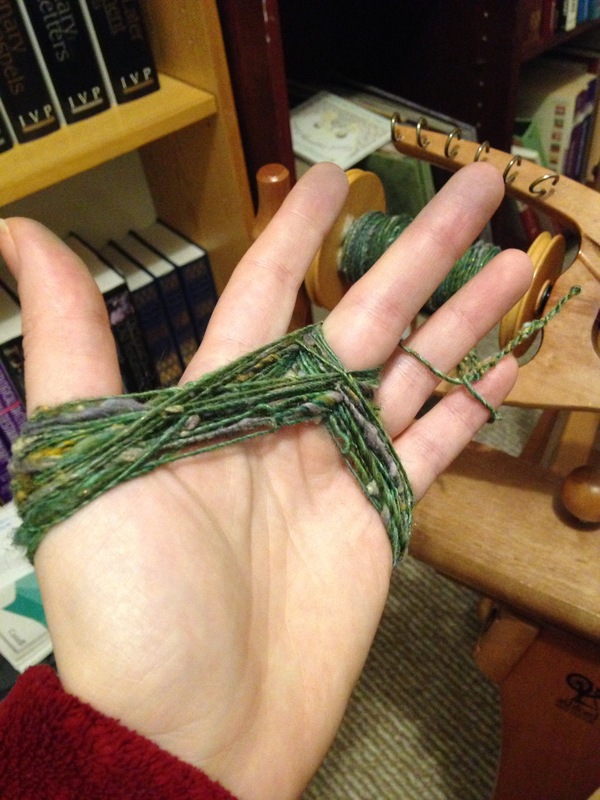 Then when I bracelet plied, they plied together. 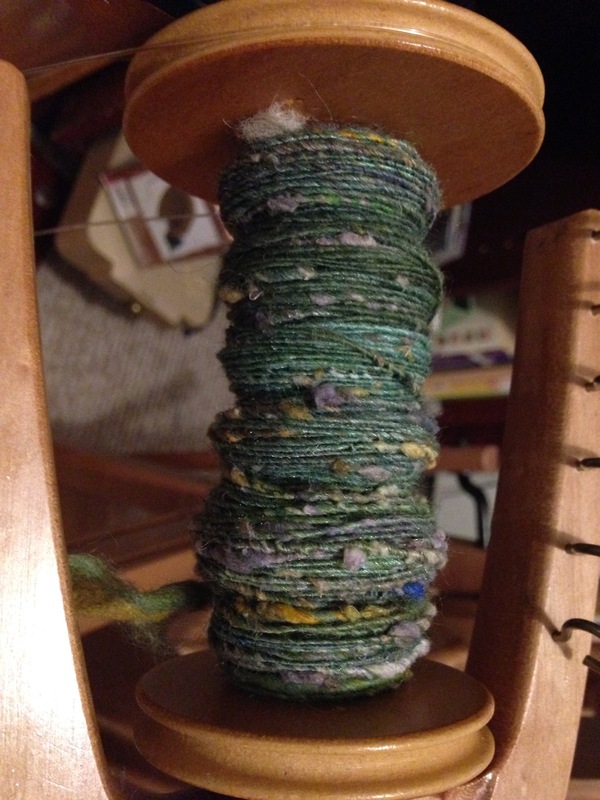 I can only credit luck with the fact that I had maybe four inches of just polwarth plied on itself at the end. I tried it and, surprise surprise, I really liked the results (far right, below). Not, I think, because of the combo drafted polwarth, but because in the interim – by spinning the punis, mostly – I’d gotten generally better at short forward draft. 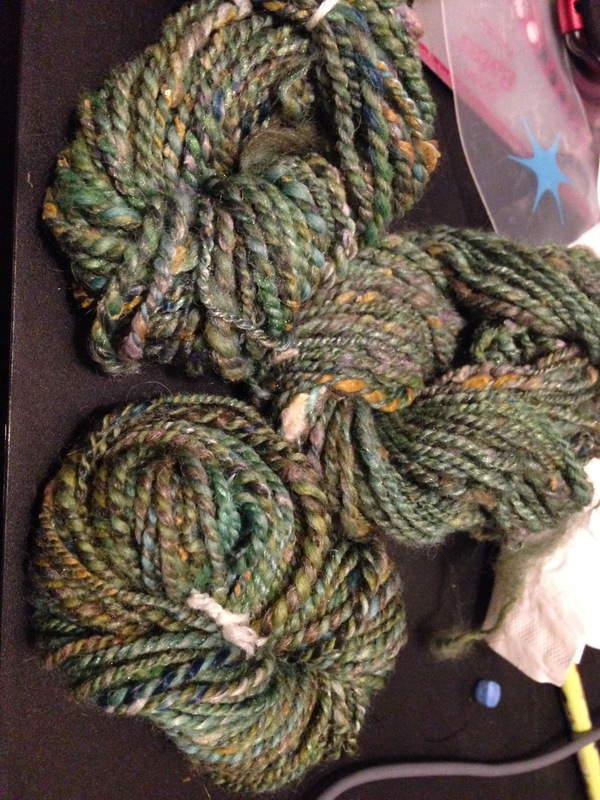 Bottom left, sample 4, combo plied, with two strips of polwarth combo drafted in the polwarth single. 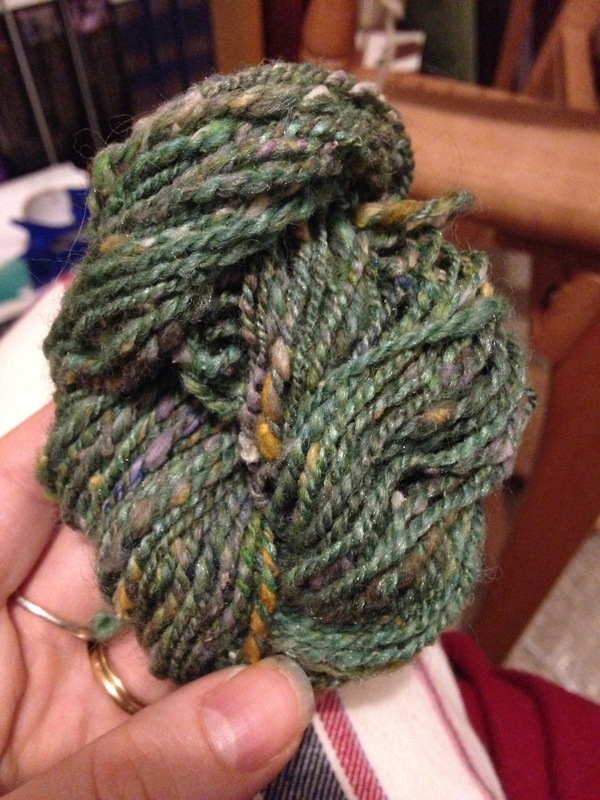 The first sample, while attractively uneven in the skein, made a fatty, messy fabric that threatened to pill immediately. 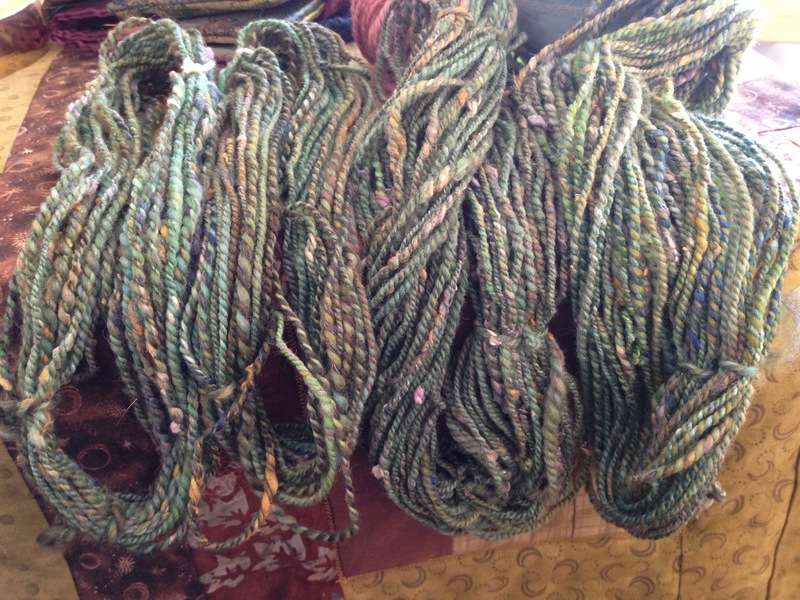 Some yarns are just gorgeous to look at and are not really meant to be knit with. There is a place for yarns like this, but not in my life right now. 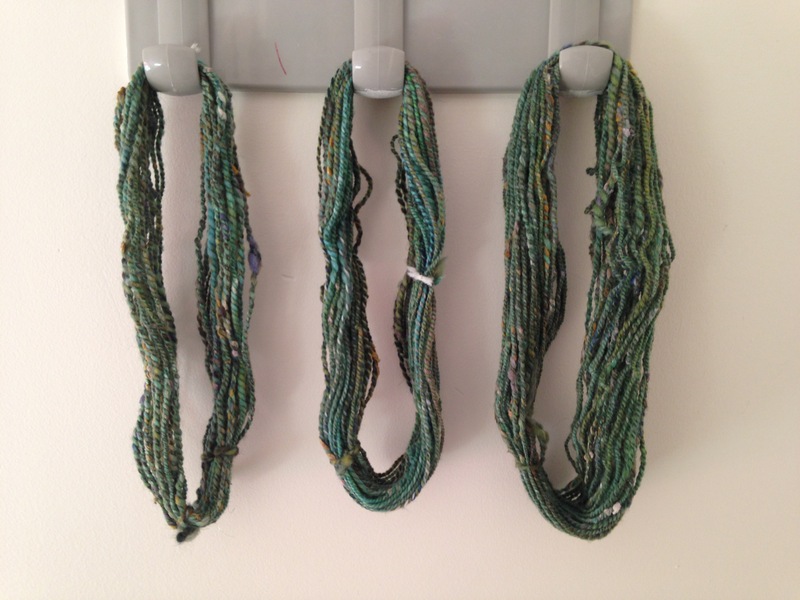 This skein inspired me to look for what I wanted, but ultimately, it did not give me what I wanted when it was knit up. The second sample was crisp, even, and kept all the idiosyncrasies of color intact. There was a little striping as is inevitable with a combo ply, but that doesn’t bother me. The two ply was tightly plied enough to not be too jagged. This was an important lesson: barber poling looks really stark in the skein, but in the fabric, it turns into wonderful little dots. In this case, those dots stood out just as much as I wanted them to. The third sample, while gorgeous, looks relatively lifeless next to the others. I enjoyed blending on the hand cards very much, but I can’t live with the loss of all the character the art batt brings to this blend. It’d be perfect for a sweater yarn, which I would want on the calmer side, but not for what I have in mind – a large chunk of stand-out stockinette, either on a large, plain accessory or a large block of a colorblock sweater. The fourth sample does have more nuance than #2, but more nuance really ends up meaning more grey. I’m going to have more grey anyway because I’m better now at drafting the many parts of the art batt together than I was when I made #2; I don’t really need to add more grey by combo drafting the polwarth. I learned a lot more from knitting these little samples. Like, for example: this 9 WPI yarn knit up at 4 stitches to the inch (blocked) on US 8s. That’s a bigger gauge than I thought. 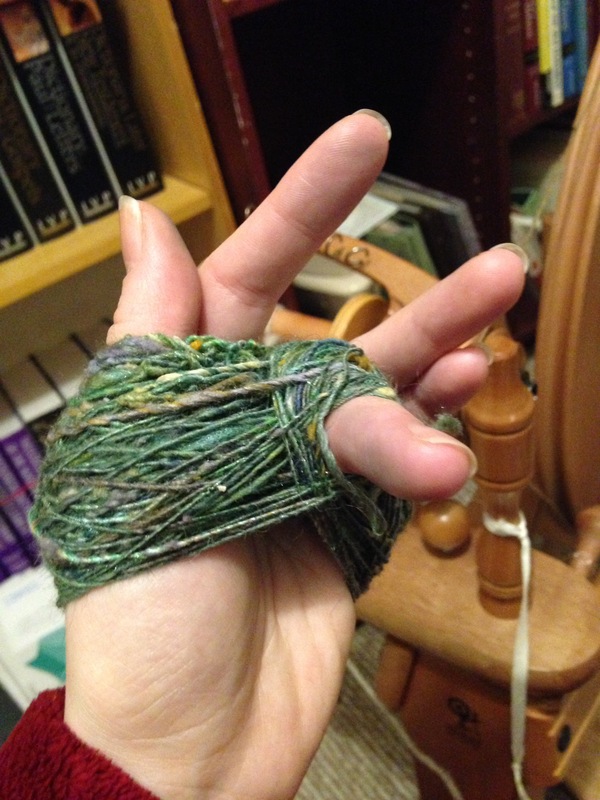 I will err on the finger side to make it match the gauge of an average commercial worsted weight yarn. More importantly, I noticed this: the yarns I fought with a little bit were the ones I loved the most. The carded sample was easiest to spin, but the ones where I was struggling against even drafting? Those had the pops of color that I loved. I realized, to get the yarn I love, I need to surrender to the unevenness and unpredictability of this spinning process. I don’t want an art yarn, but I do want a yarn with a little texture. So I should relax, and spin to a sample, but also let the yarn be what it wants to be. The imperfections are what will make me love it. There will be a time for a perfectly even yarn, but that time is not now. Well, that was quite a drive-by of a post! If you’ve made it this far, thanks so much for spending your time with me. I find this sampling process incredibly informative and motivating. I even had my fifteen minutes of fame when Rachel used my questions about this spin in her latest Wool N’ Spinning radio podcast. That podcast is exclusive to her supporters on Patreon, but if you support her at even 1$/month, you can hear the episodes. Check out her Patreon page; you can hear her reading my goofy post on episode 3. If you can’t tell, I ended up choosing to spin the combo ply (sample 2 above). And, in the interim between these posts, I’ve spun about three quarters of it. I’m very much hoping it’s finished by next week (though the Big Work Thing has its biggest push this week, so no promises). I can’t wait to ply it up and see how this story ends! I hope your Lent is off to a good start. By which I mean you’ve already failed miserably and thrown yourself on the mercy of Christ. I know that’s where we’re at in this house. Blessings!